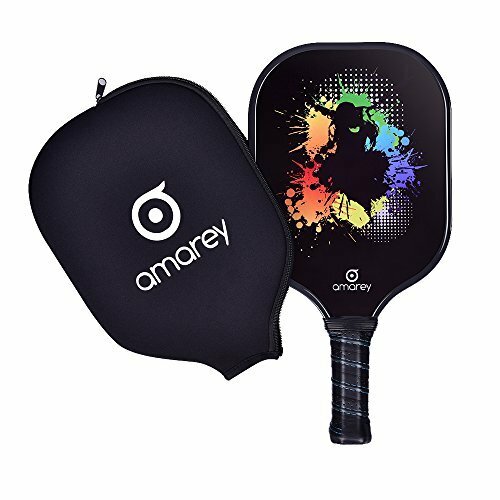 Amarey Graphite Paddle was designed to be awesome pickleball paddle for both beginners and players ready to take their game to the next level. With the same thickness as a fingernail, Amarey pickleball paddle's graphite cover provides a firm, long-lasting paddle surface for perfect accuracy. The graphite surface is mechanically bonded to the polymer honeycomb core for a b yet flexible panel structure, providing consistent lobs, dinks, and volleys. With a lightweight of 8 OZ, Amarey pickleball paddle strikes the perfect balance between great gameplay, control, power, and maneuverability. This pickleball racket is noticeably lighter than any wood paddle, ball comes off the racket face with power and control. This pickleball paddle is excellent for beginners to intermediate players. LIGHT BUT DURABLE AND BALANCED - With a lightweight of 8 OZ, our pickleball paddle strikes the perfect balance between great gameplay, control, power, and maneuverability. This pickleball racket is noticeably lighter than any wood paddle, ball comes off the racket face with power and control. PREMIUM GRIP, PERFECT HANDLE SIZE - Amarey pickleball paddle could be nicely handled. Perforated, sweat absorbent cushioned grip of the paddle help you enjoy longtime play without fatigue. Handle circumference at 4.25 inches allows for wrist action, spin, power and quick hand changes flawlessly. UNBEATABLE SPECIFICATIONS, INCREDIBLE VALUE - This pickleball paddle comes with a graphite face with honeycombed polymer core which provides nice pop while the PP honeycomb core gives the paddle great feel and touch. The beginner paddle is vastly superior in feel, balance, and construction. Our puickleball paddle virtually eliminates dinging and denting. THE EDGE GUARD OF THE PADDLE PROVIDES BEST PROTECTION - Pickleball racket has an edge guard which provides protection on ground hits. Low Profile EDGE GUARD protects paddle edges, yet slim enough to reduces mishits it features corner-shield and Interlocking neck-guard, greatly enhance strength and durability. COMES WITH RACKET COVER EASY TO CARRY - The most popular pickleball paddle in the world, unique design, excellent touch paddle for superior ball control. Excellent for beginners to intermediate players and take your game up a notch. If you have any questions about this product by AMAREY, contact us by completing and submitting the form below. If you are looking for a specif part number, please include it with your message.